My mom put me in piano lessons in a Conservatory when I was 3. I’m not sure the Conservatory should have accepted a 3-year-old, but my mom said they were more than happy to take her money. I still have all my piano books from back then. Later I learned from a lady that was an amazing piano player and really knew her stuff. However, knowing something and being able to teach it, are two completely different things. I would say the biggest thing missing from my childhood piano lessons was learning the joy of piano. I did recitals, played conservatory pieces, and did theory exercises. I wanted to learn the piano but it was a dry experience for me that was more like a chore for me than an enjoyable hobby – my practice time (or lack there of) was a testimony to that. Now, I have a young daughter who is currently 3. My mom had asked me why I hadn’t started teaching her the piano using my childhood piano books. I tried to a couple of times, but it was boring for both of us and my daughter did not enjoy it, so I decided not to continue. I did some research, I knew there had to be a better way. I came across the piano play by color concept, where you tape various color pieces of paper on the keys of the piano, and the musical notes are colored with the corresponding matching colors. There are a lot of piano by color music books on the market, but I decided to save money and make my own. It took me a bit of time, but I created my own color coded music sheets of a few songs my daughter likes. I tried out this method with my daughter but decided this was not my idea of learning music. A little discouraged we just stopped with the piano. I figured I’d get my textbook-like Conservatory books back out when she was older. Fortunately, I didn’t have to wait that long. By chance, I stumbled on “Hoffman Academy” and very quickly I knew this was the way I wanted my daughter to learn. I’m sure you will appreciate it for your children as well. The Hoffman method includes ear training, sight reading, improvisation, music theory, rhythm, solfège, and technique. It currently has 60 online video piano lessons taught by Mr. Hoffman. He teaches in a fun engaging way using stories and games, and in a way kids can understand and relate to. My 3-year-old just loves it! Did I mention that all his online piano lessons are free? Free is always a great perk, but it’s not the criteria I base my choices on for my daughters education. I would be choosing his method for my daughter even if he charged for his lessons. He also has downloadable materials to supplement each of his lessons – mp3’s of the songs to practice with, listening mp3’s, music theory worksheets and activity pages, song sheets, etc. He does charge for this supplemental material – $19 for every twenty lessons. The material for lesson one is free to try out, and very quickly I realized that I wanted to buy this for my daughter. Perhaps if I was doing the lessons for myself, I would just do the video lessons, but for children, I believe it really helps reinforce what is taught. When to start piano lessons for kids? I read on his website that he doesn’t really recommend starting piano lessons before age 5. With my 3-year-old, I do see limitations in having smaller hands and shorter arms. However, his lessons are explained in a way that my 3-year-old can easily grasp. She is learning a lot about music and piano and can play a few songs already. 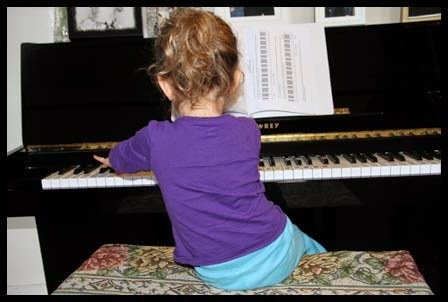 In following Mr. Hoffman’s advice, we do piano daily – this helps her see results which keeps her encouraged to continue learning. We might watch or re-watch a lesson, practice for 5 minutes or so on the piano, and we end with her doing an activity in her binder (from the downloadable material). I love how much she enjoys her piano lessons, so I try to keep our daily sessions small and manageable, to help her keep that joy. Side note: I do not know Mr. Hoffman, am not affiliated in any way with Hoffman Academy, and do not get compensation of any kind for my review. I just do a lot of research in making educational choices for my daughter, and like to share different gems I might find on the way. This one is worth sharing. UPDATE: See my newest review of Hoffman Academy 2.0, a premium membership that includes the worksheets, practice tasks, games, and more. Thanks for sharing at The Thoughtful Spot! I’m not sure about my area as I never looked into it, but my mom told me she did an extensive search when I was 3, and no one wanted to take a child so young. Finally, after many rejections, she found a place that took me. I have wanted to get my kids into piano lessons. Thank you for this resource. Synchronicity! My daughter just said to me (she has played the recorder all year in homeschool band), “I want to play the piano instead!” Thank you!!!!!!! Thank you so much! I happened on your site and saw your beautiful daughter making buns. 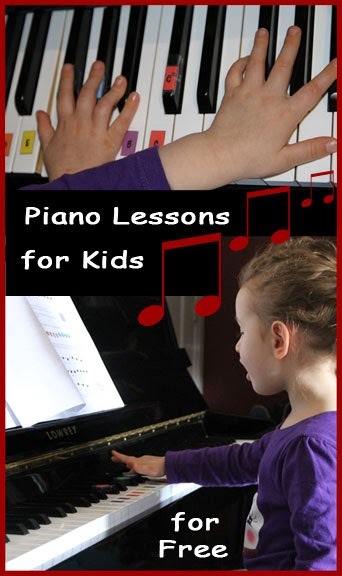 Then read about piano lessons that are fun and free. We just adopted 4 siblings from foster care ages 10, 8, 5 and 4. They would so benefit from piano! We can’t afford it but now we can. I will be on the hunt for a used piano now. Blessings to you and your little one. Thank you Doreen, and congratulations on the adoption! I hope you find your piano. If I had to buy a piano again, I don’t think I’d buy a black shiny one a second time, always issues with fingerprints and much too delicate, easy to scratch. I think I’d buy a regular wood finished one that could withstand some dents from kids and easier to dust :).